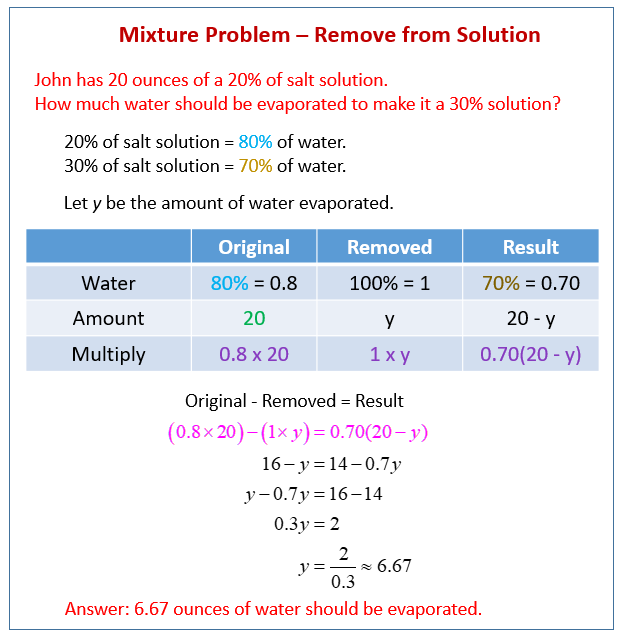 Mixture problems are word problems where items or quantities of different values are mixed together. We recommend using a table to organize your information for mixture problems. Using a table allows you to think of one number at a time instead of trying to handle the whole mixture problem at once. John has 20 ounces of a 20% of salt solution. How much water should he evaporate to make it a 30% solution? Set up a table for water. The water is removed from the original. Example: How many pounds of dogfood that is 50% rice must be mixed with 400 pounds of dogfood that is 80% rice to make a dogfood that is 75% rice? Example: Ten quarts of pure apple juice are added to 90 quarts of a fruit juice that is 10% pure apple juice. What is the percent concentration of pure apple juice in the resulting mixture? How to solve percent mixture problem using one variable? Example: Five pounds of candy that is 20% chocolate is combined with a candy that is 40% chocolate. How many pounds of the candy that is 40% chocolate should be used to get a candy that is 25% chocolate? Example: How much water should be added to 30 cups of juice that is 70% juice to get a diluted mixture that is only 60% juice?